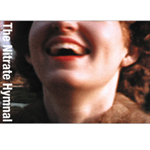 The Nitrate Hymnal is a record of songs taken from the hit post-punk opera of the same name, a joint collaboration by Anti-Social Music and the Gena Rowlands Band. The recording presents reorchestrations of songs taken from the original opera production, and hits stores in April 2006 courtesy of Lujo Records. The Gena Rowlands Band and ASM met three years ago during the creation of the original production of The Nitrate Hymnal by Bob Massey (Gena Rowlands Band, ex-Telegraph Melts) and David Wilson (True/False Film Festival). The opera was inspired by 50 years of actual home movies given to Bob by his grandfather, and told a fictional story of a couple who obsessively filmed their lives. Staged in a Masonic temple, lit by three giant projection screens, and bringing together players from D.C.'s underground rock scene (ex- Circus Lupus, Crownhate Ruin, Frodus, Mary Timony Band) and New York's avant-classical scene, The Nitrate Hymnal sold out its four-night run and won lavish press attention. "Despite Massey's pedigree as a post-punk guitarist, much of 'Hymnal' hearkens back to 17th-century opera, with lithe, chantlike vocal lines written as nearly continuous recitative, and a chamber orchestra (acoustic strings, electric guitars, keyboards and drums) playing a gently supportive role. But if the form of "Hymnal" hasn't reinvented the operatic wheel, its sound world feels fresh. That's not to say Massey doesn't raid a few genres – post-punk rubs shoulders with post-Sondheim; progressive jazz melds with fusion; and brief visits are paid by Shostakovich, Piazzolla and Glenn Branca – but the musical stew is very much his own. There's less guitar-driven music than you might expect from an indie-rock composer. But the canny orchestration... uses the guitars for color, to growl threateningly under the strings or simply add a little grit." For the recording, the through-composed score was cut into songs and reorchestrated by ASM and Gena Rowlands Band, then recorded in three days powered by passion and caffeine. Mixed at Brown Rice by Warn Defever of His Name is Alive, mastered at Silver Sonya by TJ Lipple of Aloha and available now from Lujo Records.